The Toro® Groundsmaster® 4000-D and 4010-D rotary mowers boast a powerful turbo-charged 55 horsepower, Tier 4 Final compliant diesel engine. With the new Smart Power™ technology, high engine torque and patented, HybridDrive™ cutting deck system, the Groundsmaster 4000-D and 4010-D deliver power where you need it most — to cut grass, no matter how tough the conditions. 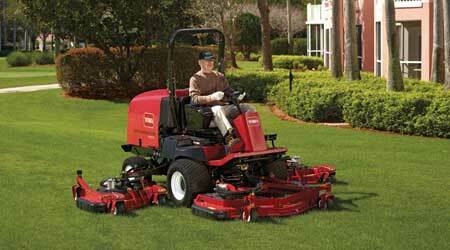 With their excellent trimming capability and an ability to mow a 0-inch uncut circle, the Groundsmaster 4000-D and 4010-D are extremely efficient mowers. The patented, parallel hydraulic traction system maintains consistent hydraulic flow between the front and rear wheels to assure full time 4-wheel drive. This allows you to mow with confidence, even on hills and wet grass. Operators can enjoy either the open-air model in the 4000-D, or a climate-controlled, all-season safety cab with the Groundsmaster 4010-D.